If you were planning on flying to the Midwest Wednesday morning, or had people trying to escape the cold, you may want to check that flight status. FORT MYERS, Fla. -- If you were planning on flying to the Midwest Wednesday morning, or had people trying to escape the cold, you may want to check that flight status. We're seeing several cancellations at Southwest Florida International Airport (RSW) in Fort Myers. At last check Wednesday morning, nine arrivals have been cancelled at RSW, mostly from the Midwest. 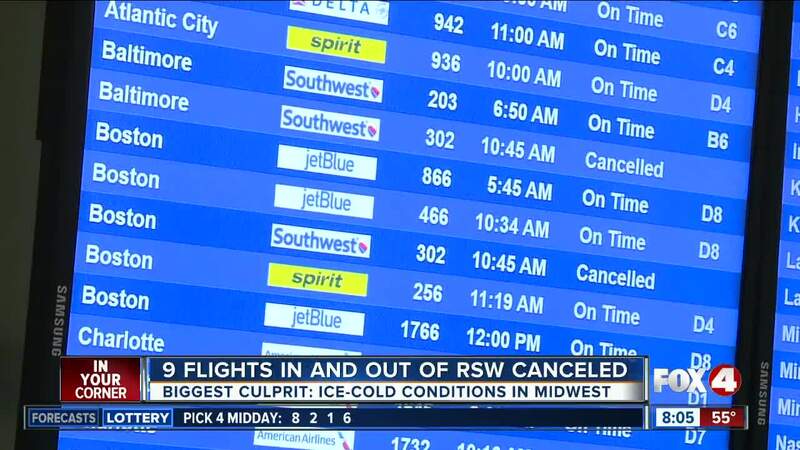 The biggest impact right now is from Chicago, where four flights have been cancelled. Nine flights leaving Southwest Florida have also been cancelled. Again, Chiacgo is seeing the worst of it with four canceled flights. One flight going to Baltimore was also cancelled.